The three top "meds," or medications, for herpes are Valtrex (valacyclovir), Famvir (famaciclovir), and and Zorifax (acyclovir). Pharmaceutical medications, or "meds" for herpes are readily available by prescription from a family physician. The most widely prescribed herpes meds are acyclovir (Zorifax), valacyclovir (Valtrex), and famaciclovir (Famvir). There are two different kinds of herpes simplex virus. There is herpes simplex virus- 1, oral herpes, which is known in the medical community as herpes labialis. There is also herpes simplex virus- 2, known as genital herpes. Both kinds of herpes are incurable. Once infected, the herpes simplex virus stays in the body forever, in the same way that diseases like chicken pox stays in the body forever. Over time, the disease goes “dormant,” but stress and other factors can cause random outbreaks. The three top oral herpes medications are acyclovir (Zorifax), valacyclovir (Valtrex), and famciclovir (Famvir). These three antiviral herpes meds, all taken by mouth in pill form, are also used to treat genital herpes, even though the two viruses are not the same. Acyclovir also comes as a topical ointment. There is another topical ointment that is used as an oral herpes medication called penciclovir (Denavir). Docosanol (Abreva) is the only FDA- approved over- the- counter oral herpes medication. Studies are mixed on the effectiveness of Docosanol. 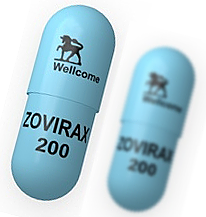 The go- to medication most widely prescribed for genital herpes is acyclovir, known widely by its brand name, Zorifax. Other genital herpes meds that are often prescribed are famciclovir (Famvir) and valacyclovir (Valtrex). For genital herpes, topical ointments such as Zorifax in cream form do not work, and are rarely prescribed by physicians. Instead, genital herpes is treated systemically, killing or incapacitating herpes simplex virus- 2 from the inside out. The Department of Medicine at the University of Indiana School of Medicine compared episodic therapy to suppressive therapy for genital herpes medications. Episodic therapy is where a medication for herpes is applied at the beginning of each outbreak. In suppressive therapy, a herpes medication is applied continually over a period of time, such as for a year. The scientists discovered that, using valacyclovir (Valtrex) for the herpes medication over a one year period, that patients receiving episodic treatment experienced more outbreaks than the patients receiving suppressive treatment. The patients in the episodic arm of the study also had a longer healing time and more painful lesions (blisters and open sores). All of the patients, whether receiving episodic or suppressive therapy for genital herpes outbreaks, felt much better than they did without any herpes medication. However, the conclusion of the study was that suppressive therapy with Valtrex was better than episodic therapy with the same herpes meds. A similar study was conducted a month later, which helped to confirm that valacyclovir (Valtrex) is effective in suppressive therapy as both an oral herpes and a genital herpes medication during the first year after becoming infected with the disease. In this study, published in 2007 by the medical journal Sexually Transmitted Diseases, valacyclovir was found to be more effective for genital herpes than oral herpes. The herpes medication was also found to reduce the number of outbreaks as compared to a placebo and generally improve the quality of life for patients with genital herpes. Web MD.com recommends the use of acyclovir (Zovirax) for pregnant women with genital herpes, and valacyclovir (Valtrex) as a close second choice. Acyclovir is used to lessen the healing time and decrease the pain during outbreaks in a number of viral diseases. Acyclovir is prescribed for chicken pox, shingles, oral herpes (herpes simplex virus- 1), and genital herpes (herpes simplex virus- 2). As a herpes medication, acyclovir is taken two to five times a day, as soon as symptoms of an outbreak occur. For genital herpes, the drug is taken for a year. Acyclovir will not stop the spread of genital herpes. Any person who is infected with herpes simplex virus- 2 will continue to be contagious even while they are taking acyclovir, and even if there are no symptoms present. Drugs.com includes a long list of less common, but serious side effects from this herpes med. Famciclovir is prescribed most often for people with shingles (herpes zoster), but can be prescribed for herpes simplex virus- 1 and herpes simplex virus- 2 as well. This herpes medication is used to treat outbreaks and prevent further ones. 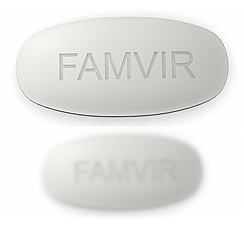 Famciclovir is also used for people with HIV who are experiencing repeated outbreaks of herpes. Famciclovir works by killing the herpes virus from inside the body. It does not kill the virus completely, and will not keep a sexual partner from getting herpes. Drugs.com has a complete list of all documented side effects of famciclovir. 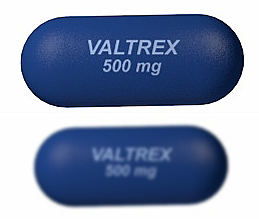 Valacyclovir (Valtrex) completes the triad of most commonly prescribed medications for herpes. It is prescribed for shingles and genital herpes, but not oral herpes. As with the other antiviral meds for herpes, valacyclovir does not cure herpes, and it will not keep a sexual partner from getting genital herpes. Valacyclovir does speed up the healing time and lessen the pain and discomfort associated with the disease. It is usually taken twice a day for five days. A complete list of all documented side effects from valacyclovir can be found on Drugs.com. Pubmed.gov, “A comparison of one year of episodic or suppressive treatment of recurrent genital herpes with valacyclovir,” by K.H. Fife, et al. Sexually Transmitted Diseases. May 2007; 34(5): 297- 301. Pubmed.gov, “Suppressive therapy with valacyclovir in early genital herpes: a pilot study of clinical efficacy and herpes- related quality of life,” by H.H. Handsfield, et al. Sexually Transmitted Diseases. June 2007; 34(6): 339- 43.